Apple‘s new iAd platform is going to be a serious contender, newly leaked data shows. The company is so keen to beat its competition in the mobile advertising space that it’s releasing a special paid analytics system that leverages iTunes data. The news comes via TechCrunch, which has received inside information from a Quattro Wireless sales rep (Quattro is the mobile advertising platform Apple bought earlier this year). This makes the information extremely reliable, and the news itself even more spicy. 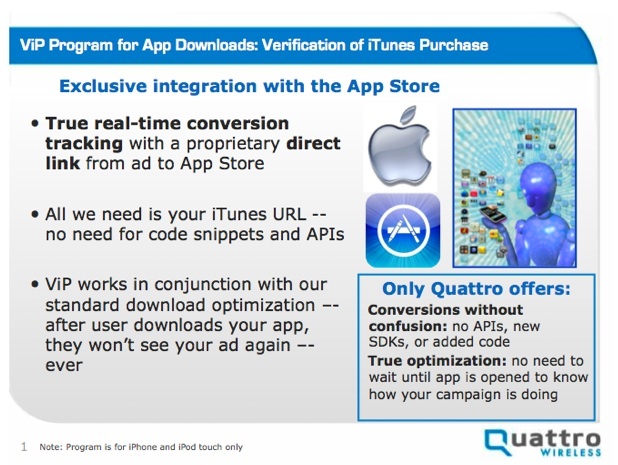 The system is called Verification of iTunes Purchase (ViP) and it works pretty much as the name implies: App developers who place an iAd in their apps, and buy into the ViP system, will get a direct measure of the conversion of ad impressions into app purchases. Is this a murky pool for Apple to be dipping its toe into though? The very fact that it’s promoting this inability for others to compete may well ring alarm bells in industry regulators’ minds. Or perhaps not: ViP would only seem to work for a specific sort of advert–in-app placements for products that a user will purchase from within Apple’s system. It doesn’t work for non-iTunes wares, like other people’s software or real-world products, and this limited scope softens Apple’s monopolistic lead. It’s also arguable that Apple couldn’t open ViP’s data to public view, as it would reveal proprietary information to its competitors, and not the good sort of “promoting healthy competition” data either. The main complication is that the FTC is rumored to be about to pronounce on the Google-AdMob deal, and some indications are that it may bar it, on monopolistic grounds. In this sense, Apple’s ViP may be in trouble. But if these rumors are wrong, as other commenters are beginning to ponder, and the deal does get approval, it would sensible to enable companies like Apple to develop strong competitor technology, lest Google’s massive bulk let it establish a consumer-unfriendly bloc in yet another market space. There’s also one more thing to note: The ViP deal seems to be targeted at the iPhone and iPod Touch only…not the iPad. Which makes us wonder if Apple’s got another secret system up its sleeves, also under the iAd umbrella, but primed to make the most of the iPad’s greater processing power and screen real estate?